It seems strangely fitting that the reviews for the splendid documentary, Salinger, are as polarizing as the man himself. One thing that all reviewers can agree on is that J.D. Salinger held extreme opinions and lived in a world of absolutes; even if those absolutes would often contradict themselves. Dichotomy existed in almost every aspect of Salinger’s life. He hated “phonies” but only wanted his short stories published in The New Yorker, which is arguably the primary feeding ground for pretentious phonies. Director Shane Salerno found a way to create a documentary about a deceased, reclusive writer with the passion and pacing of a blockbuster film. Taking material that could’ve come off as repetitive and didactic, Salerno disperses the details of Salinger’s life in an energized, staccato method that viewers either love or hate. Even well-read fans of Salinger will no doubt be surprised by some of the revelations in the film. From the heart-wrenching experience of war, to his morally questionable choices in female companions, the duality of his personality and the extremes of his convictions can be downright shocking. 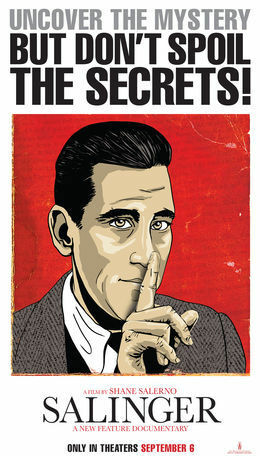 The film suggests that World War II made Salinger into the writer and the man that he became. He served as a sergeant in the military for an impressive 299 days, from D Day to V Day. The horrors that he witnessed never left him. The documentary chose to not present Salinger as a noble saint but instead it opens up his ugly sides as well. As sentimental and touching as his writing could be, as a person, he could be cold and calculated and shut people out without notice. Criticisms of his short fiction and arrogant control of his writing are also openly discussed. This unraveling of the troubled and talented author’s life is set to a jarring, at times, and always noticeable soundtrack. Music by classic composers, contemporary composers such as Craig Armstrong and modern day bands (I heard Coldplay at one point) were artfully interwoven into the fabric of the film. One of the most calloused reviews appears in Rolling Stone magazine. The author of the review says, “…posturing so florid they’d embarrass the Baz Luhrmann of The Great Gatsby.” This reviewer gave the film one star. He also gave The Great Gatsby, which I would give three-and-a-half stars, one star. I think that it’s safe to say, if you’re a fan of the layered, sensation filled work of Luhrmann you’ll appreciate the quick cuts and multiple perspectives of the film Salinger. This is a documentary created with compassion and intelligence, which gives a gradual unraveling of secrets punctuated with dramatic revelation that creates an excitement level in documentary film-making equal to that found in popular action films. It is inspiring, thought-provoking and unforgettable. *Endless thanks to the blog: Literary Beginnings and Red Carpet Beginnings for the opportunity to view and review this film in association with their website.